Contemporary arguments for inequality often rest on assumptions about human nature. Racists, nationalists, sexists and others refer to assumed patterns and processes in human biology and evolution asserting that “natural” patterns explain critical aspects of human societal difference. However, most, if not all, of these assertions are undercut by the actual data. Research into human evolution and human biological diversity refutes conceptualizations of a “naturalness” for racism, xenophobia, massive wealth inequalities, and sexism. 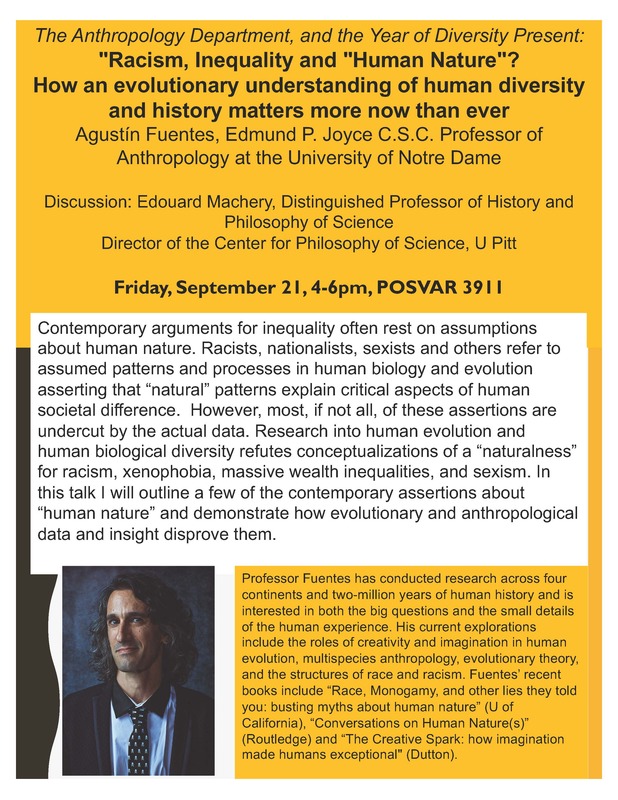 In this talk I will outline a few of the contemporary assertions about “human nature” and demonstrate how evolutionary and anthropological data and insight disprove them. Agustín Fuentes, trained in Zoology and Anthropology, is the Edmund P. Joyce C.S.C. Professor of Anthropology at the University of Notre Dame. Professor Fuentes has conducted research across four continents and two-million years of human history and is interested in both the big questions and the small details of the human experience. His current explorations include the roles of creativity and imagination in human evolution, multispecies anthropology, evolutionary theory, and the structures of race and racism. Fuentes’ recent books include “Race, Monogamy, and other lies they told you: busting myths about human nature” (U of California), “Conversations on Human Nature(s)” (Routledge) and “The Creative Spark: how imagination made humans exceptional" (Dutton).